As I write this in Singapore it is the day after Halloween. We saw a few costumes out and about, but it’s not a widely celebrated event here. Meanwhile, back home, the costumes have hit the street. I miss this time in the classroom: the parade, the books and songs, the trip to the pumpkin patch, and especially the mask making. This seems like an opportune moment to post Sleeping With Clowns to the blog . 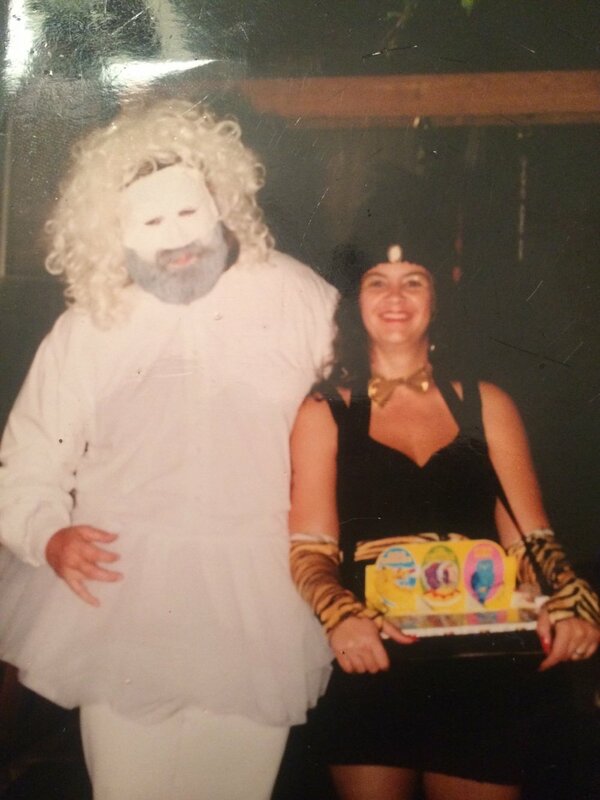 I awakened this morning to find this photo of my son Matthew with dear friend Sunee in New Orleans, in full clown regalia. A chip off the ol’ block. In case you haven’t noticed, clowns are a big thing right now. The red nose is peaking. Especially the scary clown. Scary clowns have been walking the streets and lurking in the forest on the news lately. And more recently, the movie adaptation of Steven King’s “It” has gotten a lot of attention. Not to mention the endless depictions of the “president” as a clown. Clown bashing has seemingly joined baseball as a national pastime. I love clowns, though I’m not a fan of the evil clown phenomenon. I get it though. Clowns are scary; the transformative power of the mask and all that. And I do remember being repulsed by clowns at our town parade as a kid. Getting too close and seeing how the white makeup highlighted the creepy wrinkles of the old weirdo underneath. At that same parade years later, when I was in 5th grade or so, my best friend and I followed Ronald McDonald around making nasty comments until he finally snapped. So I’ve seen the scary clown up close. Not pretty stuff. 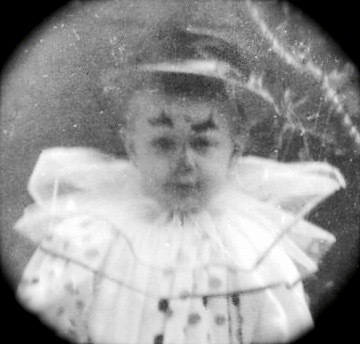 Here’s a picture of me as a clown for Halloween, aged 4 or 5. All I remember is how itchy the ruffle was, and the smell of the slimy red lipstick my mom put on my face. Photo of a proper upbringing. It’s hard to like clowns with memories like these. But I came around eventually. I think I love clowns because they are iconic figures of kid world. I’ve spent so much time working and playing with kids (my livelihood), that I’ve grown fascinated and fond of most things that relate to the culture of childhood. One day I woke up loving clowns. People change. Sleeping With Clowns, is one of my more popular novelty tunes. I want to offer it up for download before the big clown craze tanks. It’s bound to happen. Kinda like that big “folk music scare” of the early sixties. (sorry, I know how that music still creeps some people out.) This tune has a sad vibe that works hand in hand with the humor. There’s a kind of tension created by mixing those emotional opposites. There’s also a dash of bitterness, anger, regret. It’s a freakin’ clown cocktail. Who knew Bozo could be so complicated? Epic clown fail. But I still scored with this cigarette girl. Consequently, I’ve developed an ear for that kind of literal interpretation. I was in a coffee shop when I overheard two guys talking about their ex’s . “So have you heard anything from Jenny?”…”Yeah, she’s sleeping with some clown…” BINGO! A song is born. And if you happen to be starting your holiday shopping early, here’s some lovely clown gift ideas to get for that “someone special”. I especially like this copulating-clowns Hawaiian shirt. Or perhaps Smokey The Clown is more to your liking.